Intel announced that Indian smartphone maker Lava International released the XOLO X900, world's first smartphone with the Intel Atom Z2460 processor. The device will start shipping on April 23rd but will be exclusively available in India. Intel Corporation and Lava International Ltd., one of India’s fastest-growing mobile handset companies, today announced the general availability of the XOLO X900, the first smartphone with Intel inside. The device will be available to customers for purchase beginning 23rd April at a best-buy street price of approximately INR 22000. Lava also announced its long-term partnership with Croma, a national chain of mega stores of consumer electronics and durables, for promotion and sale of the XOLO X900. The partnership between Intel and Lava was announced at Mobile World Congress in Barcelona in February. 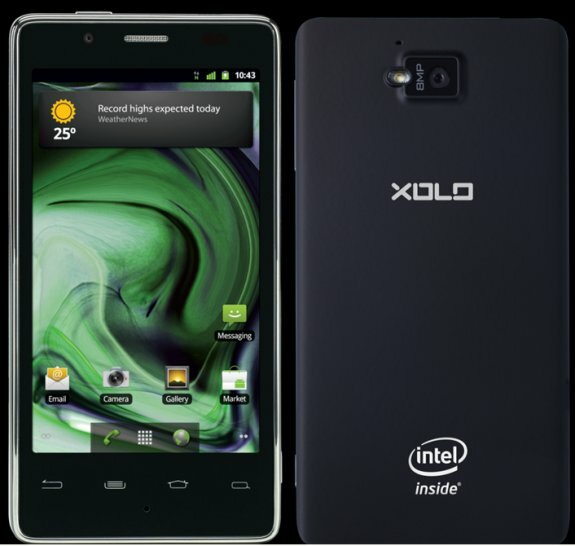 The XOLO X900 is based on Intel’s smartphone reference design featuring the Intel® Atom™ processor Z2460 with Intel® Hyper Threading Technology and supporting HSPA+ 3G connectivity. The high-performance 1.6 GHz Atom™ processor with Hyper Threading Technology brings speed and multi-tasking performance to consumers’ fingertips. The leading-edge 400 MHz graphics clock and the full 1080p HD video encoding and playback make this phone a perfect entertainment device, providing users with an immersive gaming and video experience. It also features an 8-megapixel camera delivering advanced imaging capabilities including burst mode that allows 10 pictures to be captured in under a second. The XOLO X900 is housed in a sleek design with a 4.03-inch high-resolution LCD touch screen for crisp text and vibrant images. At launch, the X900 will run on Android Gingerbread*, with a planned over-the -air software upgrade to Android’s Ice Cream Sandwich* platform shortly thereafter. Intel’s technology enables a high-performance user experience, all while maintaining great battery life – up to 5 hours of 3G browsing, 45 hours of audio and 8 hours of talk time1. “Through XOLO X900, we are happy to bring to the Indian market a device that addresses the needs of those for whom speed and performance matters. After our success in feature phones with over 10 million happy customers in under 3 years, XOLO will be a differentiated player in the fast-growing smartphone segment. The initial reviews of XOLO X900 have been very positive and independent benchmarks clearly point to the fact that when it comes to speed and performance, XOLO X900 is the gold standard,” said Vishal Sehgal, co-founder and director, Lava International. Starting 23rd April, the XOLO X900 will be available for purchase to customers from Croma and Xolo.in, followed by availability in other retail chains, general trade and online stores from early May.